Do you have thyroid issues? When your thyroid isn’t functioning properly, it can create a real mess in your life and leave you feeling run down, stressed out, unhappy and unhealthy. You see, your thyroid is responsible for a lot of things! 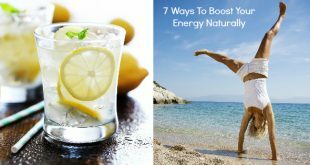 It regulates your metabolism, keeps you at a healthy weight, makes energy, keeps your moods balanced and even, helps you get a sound night’s sleep and helps you have good digestion. In fact, your thyroid plays a part in almost every physiological process. That why, when it’s not working optimally, it can really wreck havoc on your life. Unfortunately, thyroid disease is becoming an epidemic in our country. And there are still so many that have a problem and are not diagnosed. If you suspect you have a thyroid problem it’s important to see a holistic practitioner so you can get the necessary lab testing. Together with your practitioner, you can work on finding the root causes of your thyroid issue. Your thyroid problem will not go away if the root causes are not addressed. #1 Find a good holistic practitioner to seek out the root causes of your thyroid issues. Your thyroid problems will not go away unless the root causes are addressed. I cannot stress this enough. A good holistic practitioner will work with you to discover the underlying issues that are causing the problem and work towards a solution that works for you individually. Here is a directory to find a holistic practitioner near you. #2: Have your practitioner run a GI pathogen test. A GI Pathogen Test is a stool test for parasites. You need to make sure there is not a parasite infection in the intestinal tract because more often than not, those with elevated TPO or those that test positive to thyroid antibodies, have a parasite infection. Make sure your practictioner runs at least a 4 day test, to get the most accurate results. Soy is damaging to your thyroid gland because it blocks essential nutrients necessary for the thyroid to function properly. Check your labels carefully because soybean oil is used in almost every packaged product. The gluten in the United States is extremely inflammatory and acidic and is a major cause of thyroid dysfunction. Gluten causes an autoimmune response in many people and is now being examined as the cause of Hashimoto’s thyroiditis, a common autoimmune thyroid condition. Gluten also causes immune antibody production in those with elevated TPO levels. Coconut oil does not interfere with T4 to T3 conversion like many cooking oils do. Coconut oil increases your metabolism and helps you lose weight (read more about that HERE). It also supports GI and immune health, which are key in aiding the thyroid. Replace your cooking and baking oils with coconut oil and make sure to consume at least 1 tablespoon of Virgin Coconut Oil like THIS a day. I like to add a teaspoon or two of coconut oil to my morning tea or coffee. Adding 1 tablespoon to a smoothie is also a great way to incorporate coconut oil to your diet. #6 If you have hypothyroidism, make sure to cook all vegetables containing goitrogens. Goitrogens block thyroid hormone production. The vegetables that should always be cooked if you are dealing with thyroid problems are broccoli, cauliflower, brussels sprouts, cabbages, kale, bok choy, rutabaga, and watercress. #7 Avoid peanuts and peanut butter as they also contain goitrogens. #8 Eat Seaweed and other Sea Vegetables. Seaweed and other sea vegetables like nori, kombu, wakame should be eaten often. These foods are the highest dietary source of iodine and come loaded with many other beneficial nutrients. #9 Drink Bone Broth daily. Bone broth from healthy, pasture raised animals is a wonderful healing elixer that helps heal and seal the gut lining and also strengthens the immune system. Both of these are crucial for optimum thyroid health. Drink 1 cup of bone broth daily and add in a pinch of sea salt and kelp flakes to further support thyroid health. Read how to make a healing bone broth here. Stress is one of the worst thyroid offenders. Most Americans are under chronic stress from the stresses of life, food toxins, enviromental toxins, etc. The constant supply of stress chemicals, adrenalin and cortisol, produced by your adrenal glands interferes with thyroid hormones and leads to thyroid disease. Find ways to de-stress and detox so your body isn’t as overburdened with stresses. Epsom salt baths are one of my favorite healthy ways to both de-stress and detox (find my favorite detox epsom salt bath recipe <-HERE). This turmeric tea recipe is also a delicious way to effectively help detox your liver. Our body is so overburdened by the chemical nature of today’s world. Our food is toxic, our air is toxic, our homes are filled with toxic beauty and personal care products, etc. All these toxic chemicals wreck havoc on our body and thyroid health. The more we can clear out the harmful chemicals in our food and home, the better we will feel and healthier we will be. Ditch as much packaged and processed food as you can. 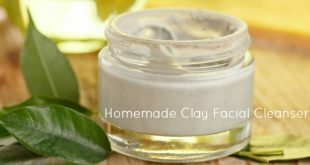 Look for all natural, toxic-free personal care, beauty and cleaning products. #12 Optimize your Vitamin A, D and K2 levels. These vitamins are crucial to good thyroid and hormone health and many recent studies are finding that those with thyroid disease are deficient in these crucial vitamins. Vitamin D can be obtained by spending 20 minutes to an hour in the sunlight each day. Make sure to use no sunscreen for at least 20 of those minutes, as sunscreen blocks Vitamin D. Use a natural sunscreen after those 20 minutes to 1 hour. You can also supplement with a good quality Vitamin D. I like using this fermented cod liver oil or this high quality Vitamin D supplement. Vitamin A can be obtained through the diet by incorporating organ meats from healthy pasture raised animals (I take frozen liver pills with excellent success – read my story here), full fat milk and cream from grass fed cows (only if you tolerate dairy), and high quality cod liver oil. Most fish oils on the market are low quality and are actually detrimental to your health because they are heat treated which cause the oil to go rancid. Rancid oil equals inflammation and free radicals. I recommend Green Pastures Fermented Cod Liver Oil Oslo Orange or New Chapter Wholemega Fish Oil Supplement fish oil brand. K2 can be obtained by eating egg yolks and butter, hard cheeses and kefir from grass fed, healthy cows. 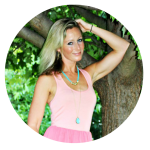 ***Update: I came across an online holistic thyroid seminar that is absolutely incredible. There are many reputable holistic practitioners, functional medical doctors, naturopaths, nutritionists and experts that I am familiar with on the panel to answer your questions like should you take iodine, how to deal with thyroid problems naturally, what tests you need to ask your doctor for, how to lose weight if you have a thyroid problem and a lot more. If you have a thyroid problem (or know someone who does) and are seeking to heal your thyroid naturally, please check out this online thyroid event. My close friend, who has Hashimoto’s signed up for it and called me the same day crying (happy tears!) and said she learned more in the first 30 minutes of it than she did the whole 10 years of seeing doctors and specialists for her thyroid. I am very picky about what I recommend on my blog, but I feel that this particular event is that powerful and valuable and I know it has been changing people’s lives. Click HERE to sign up or learn more about the online Thyroid Event. Do you have a thyroid problem? Are you treating it with more natural options? If so, can you offer up any advice in the comments? Many of these are very good, but you need to make sure you don’t have hyPERthyroidism (or Grave’s disease) before avoiding/consuming certain foods. You would actually do the opposite of some of the things you’ve recommended. I’ve found that avoiding sugar and managing stress has helped me tremendously. I can feel it in my thyroid whenever I eat sugar. Graves is not always HYPERthyroidism. I have Graves and HYPOthyroidism caused by untreated Graves for many years. I was hyperthyroidism, caused me to not sleep at nights and I would feel refreshed as though I had eight hours sleep, lost a lot of weight. However, someone saw me who knew me before and was amazed at my weight loss, she immediately told me get off that medicine that you are taking. She gave me an article that informed me how the Russians treat Thyroid. It was simple when I read it. I immediately decided to try that treatment. The treatment is “RADISH JUICE” and it worked for me. this was about 20 years ago and it worked for me, I never have to take any medicine for thyroid since then. I researched it, and it is really online as the treatment that Russian doctors used. You must mixed the radish juice with other juices. I put it in the juicer with watercrest, carrots, apples and grapes, and I drank that for about a month and I was cured. Now I only try to be stress free and check my thyroid every 6 months to be sure I’m ok; this was, as I say approximately 20 years ago. Thank God because it was a terrible situation. Go online and research “RUSSIAN TREATMENT FOR THYROID” It is there. Thank you so much, Faye! That is so awesome! I sure will do some research to it. For me with Hyperthyroidism I find it is not much information out there, unfortunately. Agree with the statement Joy makes it is important to state if these treatments are for over or under active thyroid issues. But these tips are very helpful and provides much more information that has been listed on a number of sites on the web. I have an over active thyroid and this I have been on the road to incorporating a number of these tips. The article was a big help. Thank you. Helpful tips except for the fish oil and sea veggies. I wouldn’t recommend fish oil but instead Fermented Cod Liver Oil by Green Pasture is superior compared to fish oil. Green Pasture tests their products for safety so they are clean. Our waters are so toxic these days with all the nuclear reactors leaking, Fukushims, oil spills, fracking, etc. that anything that comes out of the sea is not safe to eat these days. I really appreciate your site but I think it’s irresponsible to say you can heal your thyroid naturally. As someone who has thyroid disease our thyroid needs replacement therapy to be able to function. There are over 300 symptoms associated with thyroid disease. This should not be ignored. Yes your tips are helpful but until you can prove this is a cure I would be careful! Lindy, thank you for your comment and insight! I’d love for you to sign up for the thyroid event where you can learn how many doctors and holistic practitioners have healed thousands of thyroid cases naturally. Thyroid disease should never be ignored and treated very carefully, I 100% agree. That’s why my #1 tip was to see a holistic doctor that will work with you and your current medications. But if you’d like to learn a wealth of information about healing thyroid naturally, I would encourage you to sign up for that thyroid event. The panel of doctors are awesome on it! Lindy, I would love to chime in on this. I was diagnosed with hypothyroid over ten years ago and have been on medication ever since. Not until the last couple of years did I become aware of information about improving (and healing) your thyroid. I have now been on the GAPS protocol/diet for 7 months and have seen my thyroid antibodies (clearly indicating Hasimoto’s) go from over 100 down to under 20 (“normal”). My doctor and I are now in the procees of slowly (slowly!) decreasing my Synthroid. Looking through this list, these are the practices I’ve put in place, and it is working! A great book to read on this subject is by Isabella Wentz, “Hashimoto’s Thyroiditis- Lifestyle Interventions for Finding and Treating the Root Cause”. I’ve been dealing with Thyroid issues for 4 years probably longer but it wasn’t until having children that my body decided to let me know. These tips are great and support all the research I’ve done over the past 4 years. I’ve consulted numerous doctors – western doctors who are no help, GP’s, internist, holistic, chiropractor and now a naturopathic. Taking synthetic drugs can be harmful for many if you don’t address what’s happening. In my case T3 and T4 are not converting properly. An Endo once gave me Synthroid before checking my blood work. After 5 weeks it was like being in menopause. 1. I eat Nori Sheets almost daily rather than bread. Check your iodine levels this worked better than supplements. 2. I’ve added essential oils to my daily routine. 3. I cook all Cruciferous vegetables. 4. I see a chiropractor for weekly adjustments. Yes your spine can cause thyroid issues. 5. I exercise a min of 5 days a week. 6. Eliminated alcohol and coffee. 8. Take 30 mg of Bio Compounded Porcine (Thyroid) daily on empty stomach and wait 1 hour before eating, drinking or taking any other supplements. 9. Take 1,000 mg of Fish Oil but will be moving to Cod Liver Oil. Thank you so much for all of the helpful information you share! I have no thyroid due to thyroid cancer and I’m on thyroid replacement drugs. I do suffer from all effects mentioned above, would this still help? I suffer from poor digestion, stress, unhealthy, unhappy, etc… I’m open to natural ways to boost my overall health and happiness. I’m the same Trinity! Diagnosed in 2008, thyroid completely removed because of cancer 2009. Every day I struggle with stomach problems, constipation, bloating and now weight gain. I’m almost 60 and all my life I’ve been very active and now I’m sluggish and depressed! My libido is GONE! I struggle but my wonderful hubby sticks by my side no matter how mean I am to him. I don’t mean to be but it’s got to be my thyroid! Any help is awesome and I really need to discuss what I’ve read here with my family doctor and my thyroid Doctor! I agree! See the above website for AMERICAN MADE, NON-TOXIC personal care and cleaning products. They’re the best I’ve seen. Diane, I would love to learn more about your massage technique. Be careful of Vitamin K if you are on blood thinners. I have Graves Disease and this post made me furious. It is sheer nonsense and could very easily make someone naive enough to trust this advice even sicker than thyroid disease has already made them, if not flat out kill them. You should be ashamed. Thanks for your comment, Elisabeth, but I do stand by my article. I have a very close friend and 2 family members that have thyroid diseases (one has Graves, too) and they have been helped and healed by holistic practitioners that have followed these same suggestions. 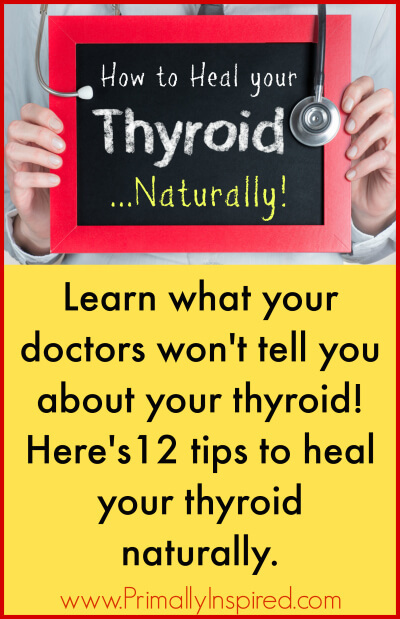 Thyroid disease can definitely be healed! Thank you for speaking up Karen! God bless! Thank you for your insight. This was very beneficial for me. The fact that some people go out of their way to berate you for this is APPALLING to me when all you’re doing is offering knowledge. I love what you’re doing and it and keep it up. If you haven’t tried anything on this list and you go out of your way to shame someone for this, YOU should be ashamed. Not the blogger. My first thought was that as a Graves patient I was always told to avoid Iodine – so stay away from the seaweed and kelp. Now that I am Hypo, do I still have to avoid the Iodine and the goigotren foods? I love radishes!!! Check out Dr Becker, a vet that has an article about using neck bones to feed dogs. Recent studies have suggested that neck bones effect the dogs thyroid. You can reach her via mercola.com. I am very familiar with Dr. Becker and recently read an article about this! Very interesting – Thanks, Sudi! I was wondering, it says to cook some vegetables. How long do you cook those veggies, and how to ensure they are no longer a problem? I like to roast broccoli and cauliflower. I also like to saute cabbage. Are these sufficient ways to cook them to get rid of the Goitrogens? My mother followed these instead of medical and surgical treatment of her thyroid issues. She died two weeks ago of easily treatable thyroid problems. That’s all I’ll say for now. I left 2 comments on here and they are not posted, probably because they are critical. Before, I’d thought the page was well-intentioned but dangerous. Now? Way to be shady. Hi Lila, I apologize for taking a few days to respond. I get so many comments a day and I try really hard to respond to each one of them because I love getting comments – both agreeable and critical comments are always welcome here. Sometimes it takes me a few days to read and respond to all my comments which is the case here. I read your comment with a heavy heart and it brings tears to my eyes to hear about your mom. Your comment stirred up a lot of emotion for me, as I remember what I went through with my dad. My dad died when I was 24 and it was the hardest time of my life. As hard as that was, I just can’t imagine losing my mom. I would think it would be 10x worse and I am so sorry you are going through this right now. I’m sure it makes it even harder knowing it was a treatable condition. I know there’s nothing I can say to make it easier or better. I am thankful that you took the time to leave a comment on something so important, though. And I agree with you. Thyroid problems are nothing to mess around with. I am not trying to pretend to be a doctor on the internet, which is why I stressed multiple times in this post to work with a trained practitioner if you have a thyroid condition. My #1 tip out of the 12 tips is to seek out a holistic doctor. These doctors are trained in medical schools where they study both conventional and natural medicine. They are extensively trained in nutrition, herbal medicine, physical medicine, and conventional medicine, including pharmaceutical drugs and you can find ones that specialize in treating thyroid conditions. My mother was indeed under the care of a holistic practitioner, however, who prescribed several of the treatments above (e.g, seaweed). What she needed was the surgery and conventional medicine that the conventional doctors had recommended. Still, I can only blame her for believing her case could be fixed the “naturopathic” ways she preferred, destroying our family in the end. You mention adding coconut oil to your coffee, but coffee is one of the foods to avoid when you are hypothyroid…. Thanks, Kerry! You can just add it to any hot beverage or a smoothie as an alternative. Probably not the coffee but the toxins that r n coffee…unless organic coffee is highly toxic…but u can add coconut oil to anything, use n place of butter, cook with it, oil pull, put on ur skin and or hair at night and it will also b absorbed into ur bloodstream…MCT oil even better n some cases to take by tablespoon n morn and or night or to add to smoothies coffee etc…. 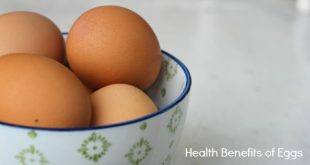 Great article – selenium and zinc are also very important in healing the thyroid. My question is what plan should I follow if my thyroid was removed and I take a daily supplement of levothryoxine? What is it call, when your thyroid stop working? My Doctor got me on Levothyroxine 112 and 125 MCG. But I still fill tried and run down and don’t have very much energy. Can thyroid every work like it should again? Magnesium magnesium magnesium ! My Dr has decreased my Synthroid by half since I began taking magnesium. yes!!! So great to hear, Barbara! Thanks for sharing your experience! 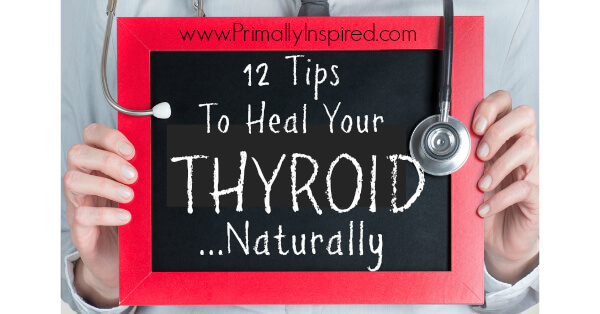 Would love to know how to heal thyroid naturally. I was diagnose with hyperthyroidism. And has nodule in the left lobe. Hi my name is Kelly Love. I’ve had hypothyroidism since I was 38…I’m now 53. I’ve suffered fatigue, weight gain, mood swings, depression. I’m on medication for thyroid. I also now take medication for depression. Thank-you for your post.I can use some of these tips…Not all of course. I’ve found meditation and yoga helps greatly. I was diagnosed with hyperthyroid. I was rushed in to hospital with a resting heart beat of 152 and lost 2.5 stone in 8 weeks even though I was eating every few hours. After 5 years of serious illnes the doctors wanted to give me radiation treatment which ment I could not stay in the same room as my family. I wasent happy with that and refused the other option was to have my thyroid removed. This ment being under active and on pills for the rest of my life. The pills put 3 stone in weight on and I decided I have to take matters into my own hands. I stopped taking my meds and hit the gym against the doctors wishes. I started with light weights and monitored my heart beat regularly. I then ate high protein diets. Fish, chicken, eggs, greek yogurt, rice and vegs. I went for my usual 6 month blood check and was called in. The doctors were amazed that my tests came back completly clear. They asked me how I did it. They said it was nothing short of a mirical. Im 56 years young. I train 4 days a week and now fo body building. I have been clear for three years. In may im doing the west highland way with a 12 kilo back pack over 97 miles. Hope this helps someone. Thank you for sharing, Heather! That is awesome! I was diagosed as having hypothyroid. It didn’t help. I just kept feeling bad. And, I feel SO much better. Hello Kelly… I am suffering from hyperthyroidism and my TSH is high. My weight is 43 and my age is 26… And I have lost my weight because of the thyroid. am trying to conceive with hyperthyroidism. My doctors suggest me some hyperthyroidism drugs. Am taking those tablets for 2 years but my hyperthyroidism is not in control… Am feeling stressed because of those drugs. I really hate such tablets but lifelong I have to take those tablets right? So here am searching for natural food article for thyroid. I got your article which is really awesome very useful too. Your article is really insightful which helpful for those who all looking for thyroid natural foods. And here I have found avoiding sugar and managing stress is helpful for hyperthyroidism problems it can be reduced by naturally… Thank you Kelly for this nice article. Lindy, I would love to chime in on this. I was diagnosed with hypothyroid over ten years ago and have been on medication ever since. Not until the last couple of years did I become aware of information about improving (and healing) your thyroid. I have now been on the GAPS protocol/diet for 7 months and have seen my thyroid antibodies (clearly indicating Hashimoto’s) go from over 100 down to under 20 (“normal”). My doctor and I are now in the process of slowly (slowly!) decreasing my Synthroid. Looking through this list, these are the practices I’ve put in place, and it is working! A great book to read on this subject is by Isabella Wentz, “Hashimoto’s Thyroiditis- Lifestyle Interventions for Finding and Treating the Root Cause”. This is wonderful…thank you for sharing your experience! And I agree, Isabella’s book is a great one and highly recommended! Pingback: Heal Your Thyroid Naturally With These 5 Tips! Pingback: Sanar la tiroides - Acción por la Unidad Mundial, A.U.M.